About a year ago I was sitting with my Mother in Law looking through old photographs. She showed me a Polaroid and she turned and asked me “Do you know what the Gingery mob is? It happened in this house.” I told her no and she went on to tell me that the house in the photo was the oldest house left in Durhamville at the time the picture was taken. She had taken the photo shortly before the house was demolished. She also told me that it was the house where the Gingery Mob had taken place. I remember asking her if she was there. She responded that it happened before her time, but that as a child she often heard adults speak about what had happened down at that house. According to the story smallpox had broken out and it was ordered that everyone be vaccinated. Reuben Gingery refused and it was ordered that he be arrested. He was arrested by Durhamville Constable W.D. Turner. He stopped at a store in Durhamville and asked that Marvin Durham accompany him back to Ripley where he was taking Reuben to jail. Reuben’s brothers Henry and Roger attacked W.D. 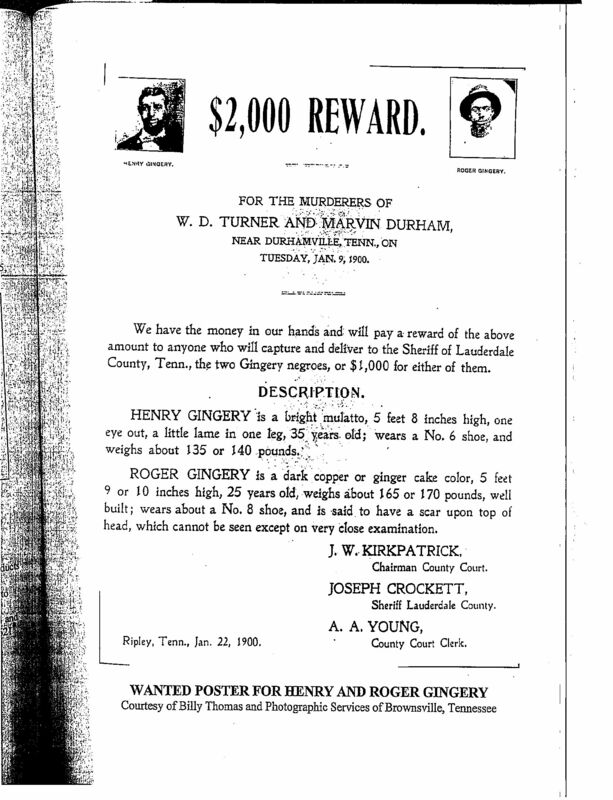 Turner and Marvin Durham and killed them both in an effort to free Reuben. After the skirmish a mob stormed the Gingery house in search of the brothers. They found Reuben and another Gingery brother Frank and the mob hung them both. A neighbor of the Gingeries was also hanged as an accomplice. Henry and Roger escaped and were never caught. Ever since she told me that story I had wondered about the Gingery family. Just who were the Gingery Brothers that committed that horrible crime? According to the 1880 US Census Henry and Roger Gingery were the sons of Thomas G. and Julia A. Gingery. On this census Henry was 12 years old and Roger was 6 years old. Other children in the Gingery household in 1880 include Frank Gingery, 4 years old, and Dolieoughfer (Reuben?) Gingery, 5 months old. Henry Gingery would marry Caroline Dangerfield on 27 December 1890 according to Tennessee State Marriage Records. They would go on to become the parents of 4 children, Johnny, Fox, Winnie, and Hubbard. On both the 1900 and 1910 census Caroline listed herself as married although her husband had been gone for years and she was living with her parents. According to the 1900 US Census Julia A. Gingery was widowed. She listed herself as a mother to 12, with only 5 children living. In the household with her were Maggie Gingery age 18, Dupuy Gingery age 11, and John Gingery age 9. Her two sons Frank and Dolieoughfer (Reuben?) Gingery were hanged for the crimes of their brothers and Henry and Roger Gingery were never heard from again. On the 1860 US Slave Schedule there is a Jacob Gingery listed. Perhaps Thomas G. Gingery was a slave on Jacob’s plantation. I wonder what ever happened to Henry and Roger Gingery and if they knew what happened to their family due to their actions. Source: Hellums, Clarice Haynes and Kara Haynes McCauley. Visions of Lauderdale County Past and Present. Memphis, TN Allan & Akin Printers, 1996. I am the great-great granddaughter of Johnnie Gingery-Woodard, of Ripley,TN. Please contact me. I would love to talk to you. My details are below.